As I type this, I can literally feel every music teacher and musician I've ever known cringing. Before. A sad, beat up piano. Just a sample of some of the damage. Lonely piano leg, table for 1. Very recently, we moved my childhood piano from my mother's house to our home. It was already very beat up, with it's varnish flaking off in every imaginable place. There was a leg that wouldn't stay on, some of the keys have coating rubbing off, and it hasn't been tuned in at least 10 years. It needed something done to it to give it new life. So I painted it Robin Egg Blue. After a coat of primer. Now it's so pretty and still very much playable. 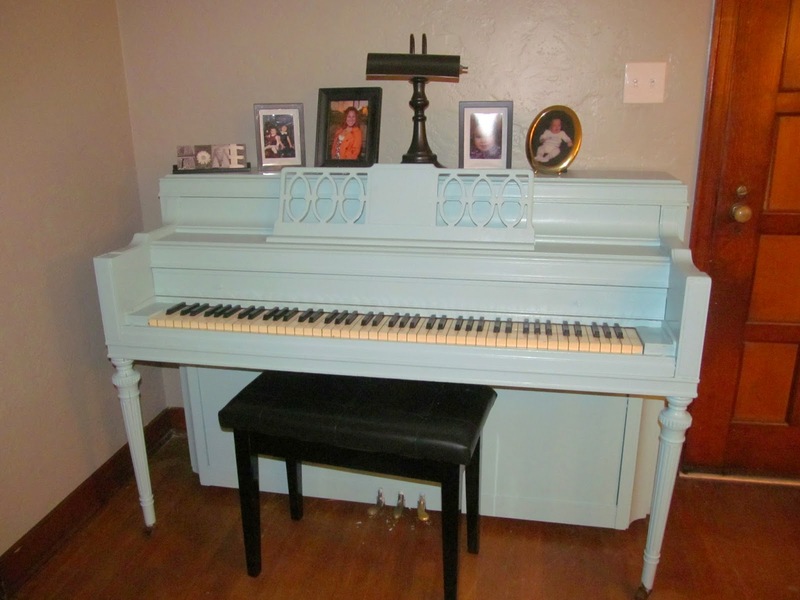 Many music experts believe painting a piano in such a "crude" manor will damage the sound quality and overall health of the instrument. Here is my opinion: It was already not in the best of health, something needed done, and it's not a brand new, baby-grand Steinway being used for the best concerts Carnegie Hall can have. It's an old, beat up, at home piano that my fiance and I use to keep up with our once brilliant music skills, for warming up and practicing our singing, and for preping for any community theatre auditions. Can it really harm it that much that it won't be useable for those things? I think not. I love it so much. It matches the canvas above the sofa almost perfectly and the pillows I made look great with the colors. As a temporary fix for the leg, we've kind of just shoved it under so the piano has more support. We're also going to bring a piano tuner in soon. I can't wait to see that reaction. ... a far cry from what it used to be! In addition to the piano, we also added some Ikea shelves for storage and decor and a new floor lamp. Now it feels like a finished space.